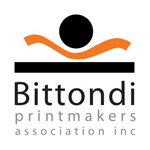 In January Bittondi members Michelle Lane, Beth Evans, Mei Wong and myself were part of a large group of printmakers who participated in an advanced etching workshop conducted by master printer Martin King at the Australian Print Workshop in Melbourne. The workshop has wonderful facilities and is equipped with large presses in a spotless working environment. It adjoins the gallery where there are regular exhibitions of prints, often produced in the workshop by artists who have worked in collaboration with a master printer. Another plus is that it is located near some innovative cafes and restaurants serving great food, coffee etc. Degreasing was achieved via soy sauce and a little whiting. We all made an image via the crayon method onto an aquatinted plate and these were eventually printed. It was good to see the method of dampening a stack of printing paper with a thick sponge, ensuring the each sheet received an even amount of water, wiping with the grain of the paper before being sealed up in an airtight plastic bag and placed under a board. Martin also demonstrated the use of litho tusche thinned with water to form a wash that was freely applied to a plate then completely dried on a hotplate. When open bitten the reticulated textures produced some very interesting effects. Some of the trials and tribulations that are often associated with spit bite were explored with some mixed results. Martin prefers using nitric acid for this rather than ferric chloride so extra precautions are necessary. Overall it was a very enjoyable workshop spread over three days. The range of images produced by artists from across several states made a most interesting display. Given the many other attractions that Melbourne has to offer printmakers such as the cornucopia of materials on sale at MES and Neil Wallace art supplies, the Printmakers Gallery and many other venues exhibiting original prints, I can thoroughly recommend a pilgrimage there.